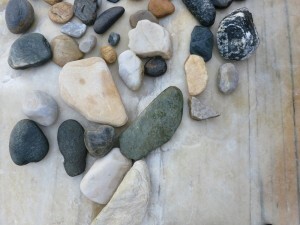 Share your thoughts with us and get part of “Stone Diary 2″! The following contributions are made by Michael Gfrerrer, our blogger and future assistant in Jumla! In 19 days’ time, on the 27th of august, our journey to Nepal will start. There is not much time left to prepare last essential things (or which we think are essential). In any case it will be an adventure where preparation will quickly reach its limits and instead improvisation will happen inevitably. There are several things that we can only decide on the spot or rather things that we can’t decide but things that will develop on the spot. For example, most fundamentally, to find the materials that we will work with. 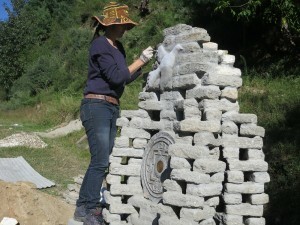 But also how the local people will help us and participate in creating the sculpture is not clear yet. Therefore, how the sculpture will finally look is still completely open. At first Helga wanted to integrate the face of the goddess Tara in the sculpture, but some days ago Radha asked her not to do so. The reason why Radha wouldn’t prefer a picture of Tara is the same why Helga has had the idea to integrate such one: Tara is a Hinduist goddess. 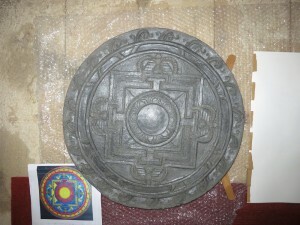 So Helga thought, it would fit the Nepalese culture, but in fact Radha told her, that she would prefer a symbol that has longer range, a symbol that signifies PEACE for all human beings. But that is definitely not an easy thing to find. Which symbol signifies PEACE for you? Today I have seen a painting with this inscription on it: “Krieg ist die bösartigste Verneinung der Liebe” which could be translated by “War is the most vicious negation of love”. “Krieg” and “Liebe” are written in red coulour, the rest of the text in green, the background is kept in shades of grey, in the foreground there is a flower vase standing upright on a table but from the side from behind appears a skeletal hand which seems to threaten to knock over the vase. This painting has made me think: Why do we negate love? If the negation of love is war, the affirmation of it must be peace. So, peace is the most beautiful affirmation of love, I would say. What these two words “affirmation” and “negation” definitely contain is activity; something happens because we want it to happen or else we don’t want it. This certain amount of activity also plays an important role in Miteri, I think, which is a pratice – and the word “practice” expresses already everything – a practice of peace, of mutual respect and compassion for each other. It’s a practice, that means: it has to be done and it doesn’t happen by itself. It has to be done but it’s certainly not an easy thing to do. No activity that brings us good is such an easy thing to do but you can learn and get better. But at first there is the decision, and if you have decided for the way of peace, violence is no way out any longer. You can’t just shot over your problems, you have to solve them by your understanding and by searching the right solution with a lot of patience. So the most beautiful affirmation of love is certainly a greater challenge than the most vicious negation of it. It’s in fact a real challenge which is worth taking it up. Recently, additionally to her job at the VHS, Inge Patsch has got engaged in “Social Business”; she works for an organization called “Nepal Social Business” that tries to support financially small new starter companies which pursue certain aims: One the one hand their purposes, products and results should sustainably contribute to an improvement of social conditions; on the other these enterprises seek to treat their employees in a human way and guarantee them fair working conditions. It’s not to make profit that should be in the focus of their attention but to contribute to a real social improvement. 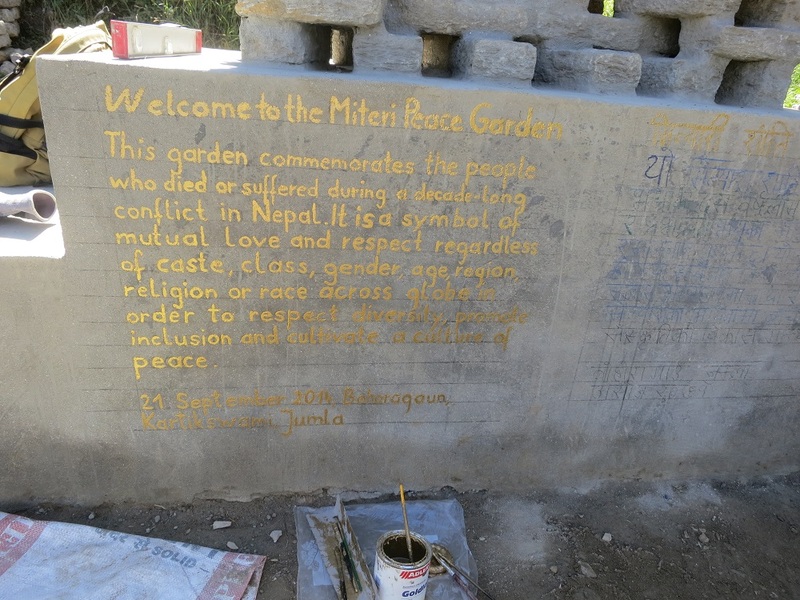 One project which will get hopefully some support is the Miteri Peace Commemoration Center. Through Inge, who studied together with Helga in Salzburg, Radha and Helga have got in contact. Today we visited the city of Bakthapur, a not far away neighbour town of Kathmandu. Our guide Hari, who also works at the VHS, showed us the historic center of the city and made a small tour with us. An experience we all felt the first day was certainly the following: We are foreigners, we are white, we come from another world, a different planet. It’s not that the Nepali people made us feel this way, it’s we ourselves that had these emotions which naturally include a certain insecurity how to act, how to speak, how to look at people. It’s maybe what is called “culture shock” in a scientific language but in my view this expression has got a too much negative connotation and therefore doesn’t fit to describe the situation correctly. It’s not a shock we have, we aren’t stroken immobile, we can move and react, answer and ask questions. But it’s a challenge, like someone has stopped you holding your arm and wanting you to look beside the street you were travelling. This experience is a demand to us, the starting point of further experiences. We can only try to answer this demand as well as possible. The concept of AWON is to engage in several different areas and not to concentrate only on one. With this holistic approach they want to cover as many areas as possible with their social commitment. They see themselves as starters and initiators, knowing well that they can’t change anything without the people willing to getting active themselves and participating in their projects and also continue themselves. The idealistic power and spirit of Radha and her team deeply impressed us and gave us too a lot of power for our project in Jumla. To do such a precious and important work that the team of AWON does, without any payment or safety, under such difficult circumstances as there are in Nepal, but with so much commitment and conviction, is an absolutely admirable and wonderful thing. 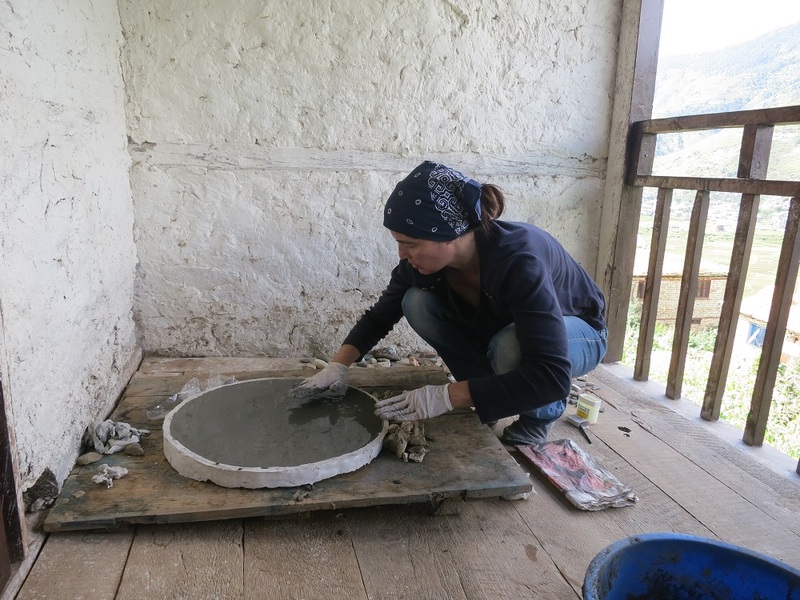 For us who come from clean and save Europe it’s nearly incredible what they get started here in Nepal and with how much energy and belief they are working on it. Today in the early morning, we took a plane from Kathmandu to Nepalgunj in the south-west of Nepal, the so-called Terai area. We’ll stay here until tomorrow when we’ll have a flight to Jumla. There we’ll live with a host family. We are already very excited and looking forward how living and working together with the Jumli (the people of Jumla) will be. We are very happy to have still Inge with us who travels to Jumla to do there a workshop concerning Social Business. 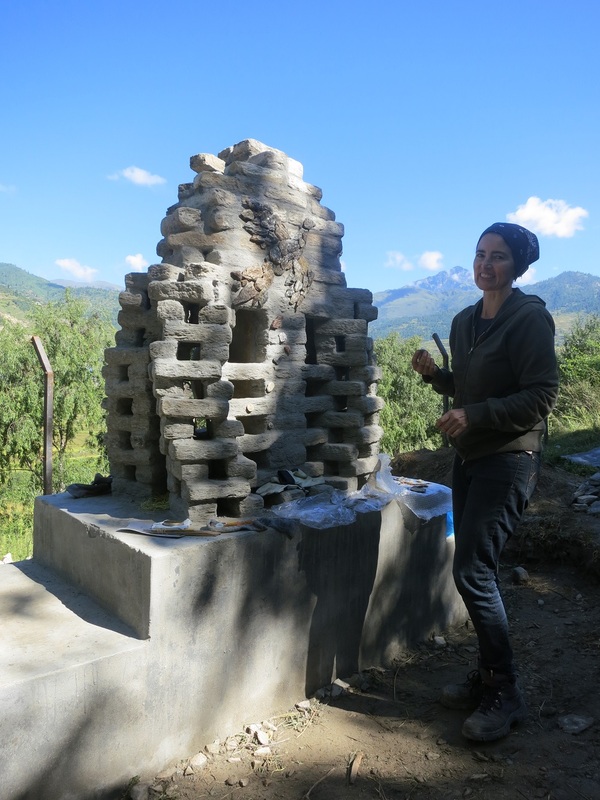 She will stay one week and can help us during this time as she also speaks some Nepali and is already acquainted with some people over there. Today we finally arrived in Jumla. We were warmly welcomed by Indra, a member of the AWON team, at the airport and by Mahesh and his family at their home where we will spend the next three weeks. The beautiful landscape captured our eyes and the fresh air full of wonderful smells of the various plants and herbs that grow here made us breathe deeply and feel good. 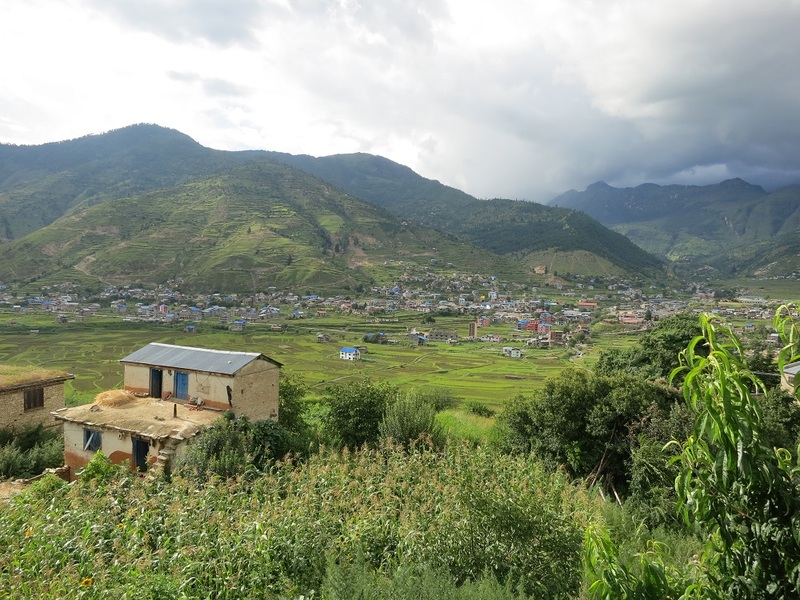 Blue roofs, green mountains, pink houses, clear light-blue rivers and red, shiny apples twinkling on the trees – Jumla and its surroundings are an oasis of nature in a high mountain area. The house of Mahesh and his family is situated a bit outside the city, upon a hill beyond a river. The place where the Peace Commemoration Center should be built is nearby our host family’s house. 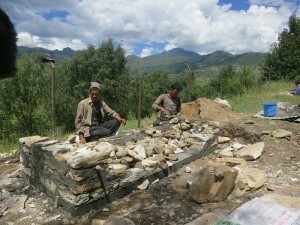 We were very impressed when we heard that 250 bricks have already been prepared for us – although Helga mentioned that she would need bricks, we would not have expected that they had really prepared them for us because they are not easy to get here in Jumla: The Jumli form the bricks out of natural stones, also for their houses they do so. One man could do four bricks a day. 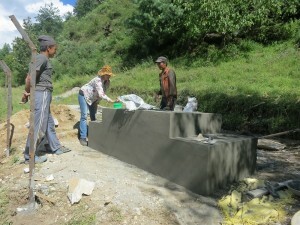 We were quite stunned by so much effort and willingness to support our project. To have bricks will facilitate our work a lot. “The people of Jumla are not poor“, we were told in Bakthapur. And we were as well told that they are poor. Probably, the first was meant concerning the supply with food and clothing that nobody has to starve or freeze to death. But in my opinion and after my measurements the Jumli are poor. Certainly not all of them, the family we stay with for example I would consider rich and very wise in their way of living and in their openness. I don’t want to insult anyone or to judge anywhere where I don’t have to judge; but I should be allowed to tell my thoughts, my opinion, my impressions although not everybody will agree. These are the names of the four men who have dug a 2.5 metres long, one metre wide and 90 centimetres deep hole today. They have dug the hole with a simple shovel, a pickaxe and some other tools to remove the stones. In the next days they will construct the whole foundation needed for the statue. These are the names of the six women who have carried the sand that is needed for the concrete of the foundation up from the banks of the river to the construction place of the Miteri Center. They have carried the sand like women and men (but especially women) carry all sorts of heavy loads (I guess the loads must be up to 50 or 60 kilograms): They carry stones, wood, rice, apples etc. in a sack on their back fastened with a rope around their foreheads. They all, women like men, were apparently professional workers. They all did good work. They all seemed to be happy to have done this work. But I had the impression that they are poor. At least it has made me think. Probably an Austrian worker is as poor as them, or poorer. – What is happiness? What is poverty? – Poverty is when there is a lack of something, when there isn’t enough of something. But who judges when it’s enough, who draws the borderline? – I for myself don’t want anybody to do anything which I weren’t ready to do myself. I don’t want anybody to live under conditions which I myself wouldn’t accept if I were in her/his place. I see that naturally there are differences in life and living conditions depending on what is your profession and which culture you belong to. But I believe that there exist certain borders where culture and profession and other criteria lose their legitimacy to justify certain living conditions. These borders are valid independently of culture around the world for all human beings. Today my mother and I we both felt a little weak. Our eyes were hurting because of the strong sunlight in the mountains. In the afternoon it has rained and we rested at home. The men continued their work constructing the foundation. Living conditions in Jumla don’t seem to be easy. People have only very few technical devices, the most part of their work they have to do with very simple tools, their hands and the force of their bodies (like carrying). This is in Jumla. In the neighbouring villages conditions must be even more difficult. Rhada told us about villages that only can be reached going on foot for many hours. In winter’s time it must be very cold in the houses where the only heating is in the kitchen for cooking. If some people compare our journey with a time travel, they are right in some way. One thing that really upset me when coming to Nepal were those great amounts of waste everywhere on the streets. Kathmandu, Nepalgunj, Jumla: wherever you come you’ll find plastic bottles, plastic sacks, old wet cardboard boxes, throwaway packaging of snacks, chips, sweets etc. just thrown on the streets, in the mud or in the rivers. Why do the people don’t care? Or do they care but don’t have the right means and knowledge to get rid of the waste? There seems to be no or very little system of correct garbage disposal, there is no recycling, no collecting of waste. The people aren’t aware of the problems that arise with this new waste caused by so-called “civilization”. In former times all waste was biodegradable and therefore there was no need to care about collecting and dispose waste correctly. But then the invention of plastic changed the world: It’s a cheap, quickly produced raw material out of which nearly everything can be produced, from technical devices for computers over medical tools used in hospitals to all these packaging materials – we live in a plastic world! Is this a great progress of the western society? How did people live before plastic and nuclear power plants? Maybe the Jumli would be better off without the influence of our plastic civilization. The Jumli women are heavy workers. The loads they have to carry each day are incredible. The women here, young girls the same as elderly women, are small and don’t seem to be very strong but they carry these heavy loads. Apples, stones, wood, cement, everything they carry on their back in a basket or a sack fastened with a rope around their head. When they carry these heavy bags, they don’t seem to walk anymore but to stagger step by step downhill, concentrated not to stumble setting each step carefully on the ground, in their faces you can see the tension, the excertion, like the exhaustion of donkeys or other animals when carrying very heavy loads. They really try to carry the maximum load they can manage. This is also a sign of poverty when you don’t have the choice to work as much as you can manage but have to go beyond your limits. If I, as a man, had to do this work, I soon would be completely shattered. It would take me a long time to get used to this heavy work and to gain the power needed. But even if I could do so, I wouldn’t like to because I would fear to damage my bones and harm my body. So I can’t understand how these women, often younger than me and more fragile, why these women should carry what I myself would never be willing to carry. Fields of rice and millet, beans with apple trees in between, gardens full of maize, chilli, cucumbers, potatoes, spinach, plum and peach trees – Regarding agriculture Jumla is definitely a very rich area. The climate seems to be optimal : A long period of rain in the summer (July and August) combined with strong sunlight and hot temperatures seems to have a very positive effect on the growth of the flora even though this location is at an altitude of over 2300 metres. The family, we stay with, does organic farming. I don’t know how many other organic farms there are, but I think most of the agriculture must be organic because there are hardly any other means here to cultivate plants in a different way than organically. I admire how much knowledge, practice and work is necessary to cultivate plants in this organic, traditional way. This knowledge is getting lost or is already lost in our industrial countries where, as a farmer, you nearly have to use pesticide, herbicides and all kind of ”-cides”, if you want to survive as a farmer. Small-scale farming, so that nearly every household has a garden and a small field for the personal consumption, has disappeared completely in Europe where small- scale organic farmers have no chance to survive without subventions. Therefore it is good to see how people here in Jumla live in near contact with nature and still know how to produce their own food and don’t depend on Spar, Billa or McDonalds. In one or two days the foundation will be finished and the building of the sculpture can get started. It sounds crazy but it’s true: We don’t have no exact plan how to build our sculpture. The only fixed points are the mandala as a symbol for contemplation and meditation and the pigeon as a world-wide symbol of peace. And of course the bricks out of which the sculpture will be constructed. The reason why we use bricks is the following: Bricks are small and easily to transport. Any other material out of which a sculpture could have been made, is either too difficult to get or to transport: A huge block of wood or stone couldn’t have been put easily on the spot as there is no crane which could get up there. On the other hand the tools to work in wood or stone would have caused problems, because there is no electricity and the special tools needed are neither available in Jumla nor could we have brought them with us. So bricks are the material which we will work with. Today, we only tried and laid the bricks without fixing them, to see how they could be put together in order that it’s stabile and looks good and similar to the clay-model Helga formed at home. Today we started building the sculpture. 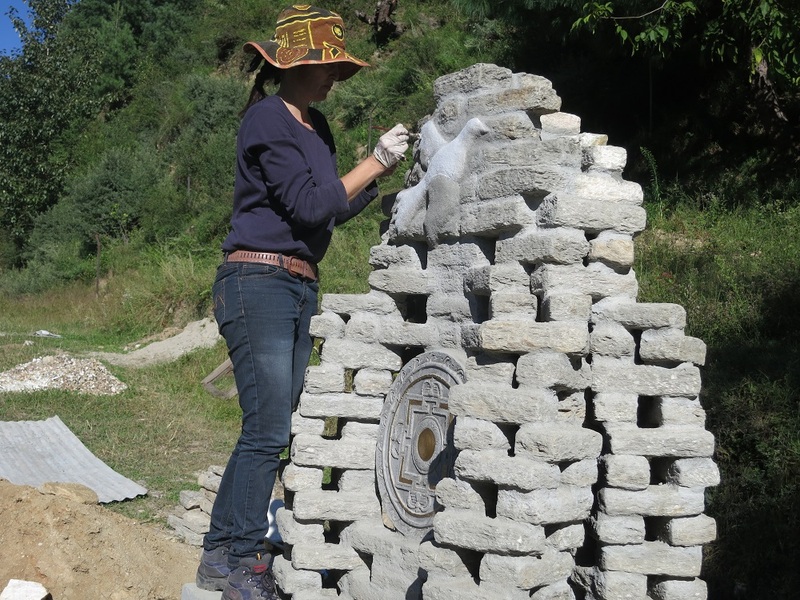 The bricks are a bit of a challenge to work with because they are very uneven and have different sizes as they are made by hand out of natural stone. But it’s not the white stone which we thought we would get at the beginning. Although they showed us, apparently only to impress us, these white bricks that are very hard, more even and more beautiful on the day of our arrival, it has turned out that we wouldn’t get these bricks to work with. The reason for this is easily explained: The white stones are much more expensive because it takes much more time and is much more difficult to produce them. This brick-surprise happened to us two days ago on Monday when we visited Yakaraj our stonemason and bricklayer at his home where he had prepared the bricks. But we have no choice. Take it or lose it! Though the people of Jumla are very nice and friendly, there have occurred some problems concerning communication. We feel this very strong since we are establishing the sculpture: People come and look or rather stare at us, so that we feel uncomfortable and so that we get disturbed in our concentration. But these spectators don’t recognize this and keep standing right beside of us staring. – That is our impression. But we are sure that most of the people don’t want to disturb us, they simply don’t recognize that they are doing it because they maybe have a totally different feeling for what is disturbing and what is not disturbing. For us the difficulty arises how to tell them that we want to be left alone. On the one hand it’s a language problem as they don’t speak English and we don’t speak Nepali, on the other we don’t want to be impolite or insult them. So mostly we have to wait and continue work as well as possible until they leave by themselves. Though working at a quiet place where not many people are passing by there are always some hazardous passer-bys and even some interested people who come to visit us. Today a group of women passed by and looked very interested at the sculpture. One elderly woman seemed to know what this all is about and explained to the others. We only could understand “Shaanti Vatikaa” which means “community centre” how is called the future Miteri Peace Learning Center, and we understood: “Ama-tzora, Ama-tzora” which means “mother and son” (I hope not mummy’s boy or something like that). It seems to get round that two crazy whites, a mother with her son, are building on a crazy sculpture (or whatever this should be, a temple many think or a statue …). Building the sculpture or “the statue”, as many people call it here, is very exciting because we don’t know how it will end; we neither know how it will look like in the end nor how the next row of bricks has to be laid. After each row we have to think about how to continue. It’s a double-challenge to form something stabile out of them and at the same time something good-looking which fits our vision. It’s like solving a riddle or improvising because you (or at least we) can never foresee or plan how it will develop. In one or two days time our brick-art-baby will reach its full height. After six days of bricklaying we have finally finished this work. In the next days ‘til Friday we’ll work to complete the sculpture. But enfin no bricks anymore! When difference sticks and doesn’t move. And be different yourself too. Our visitors and spectators unconsciously contributed to the creation of the peace sculpture: Many of them looked inside the sculpture as if they were searching something inside. So Helga had the idea of putting something there, namely some golden colour. So today we coloured some bricks and the walls of the inner space and also the backside of the mandala in order to give our visitors something they could find inside the sculpture. These contributions have made us think that also in future time the sculpture could be continued if there were people who felt inclined to do so. What we mean, is: our sculpture isn’t finished. It is open for further development maybe by the Jumli people or by somebody else from outside. The sculpture is more or less finished. We are awaiting Rhada’s arrival in Jumla for celebrating peace day on Sunday, the 21st of September. Apropos “peace garden”: As we got to know now, this is the correct translation for Shaanti Vaatika and not “community center” as I’ve written once before. “Shaanti” stands for Peace. Today in the morning an elderly woman came to visit us. She was minding two very beautiful cows. The cows weren’t on a rope as one might think, no, they could move completely freely, the woman only had a thin branch of a tree in her hand to lead them wherever she wants them to go by hitting them softly on the back or on the side. This is like all herds-men and –women are minding their animals here. 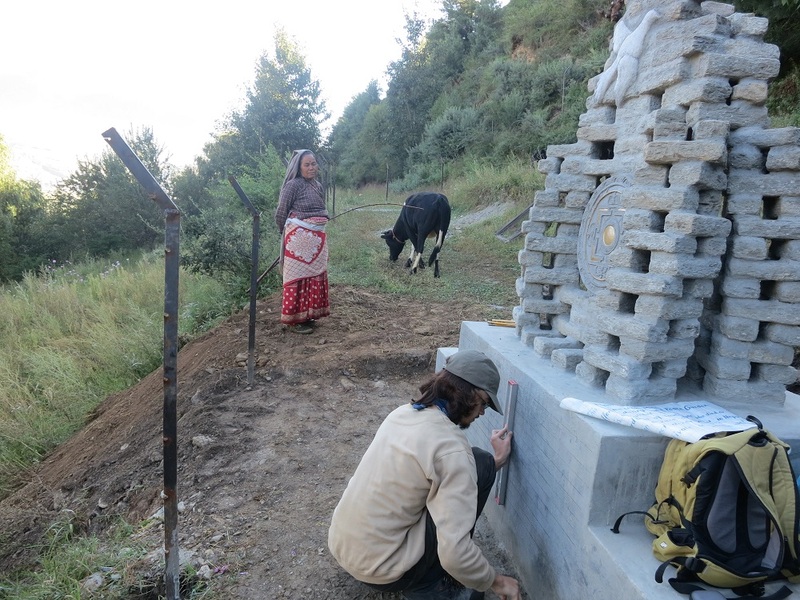 The woman came near to the sculpture to watch us working, she smiled at us, she liked our work, then she watched her cows again standing quietly and obviously amused about us. Then all of a sudden, a mobile phone rang. Slowly she began to search for something in her very traditional Jumli clothes and pulled somewhere out of her robe a mobile phone, looked at it shortly and picked up the call. Apparently it was a call that she has to come somewhere because shortly after having finished telephoning, she took her tree branch and led her two cows downhill to a bigger path. Though beating wheat by hand, though carrying apple-baskets up to 80 kilograms, though cutting wood only with a simple axe, though living such a hard live, I think each Jumli has got a mobile phone and is on facebook. Certainly not every Jumli but I have to remark that the amount of Jumli and Nepali who have got a mobile phone and who are online is much higher than someone would expect or conclude due to the living standards. Today we’ve finished the inscription in German and English. Nepali is not finished yet but will be done by a professional writer because we ourselves don’t know how to write in Nepali. Rhada has arrived today. We were very glad to see her again and to show her the outcome of our three-week stay in Jumla. She thanked us a lot for our efforts and honoured our work with great pleasure. Today’s the day we all waited and worked for: The International World Peace Day. 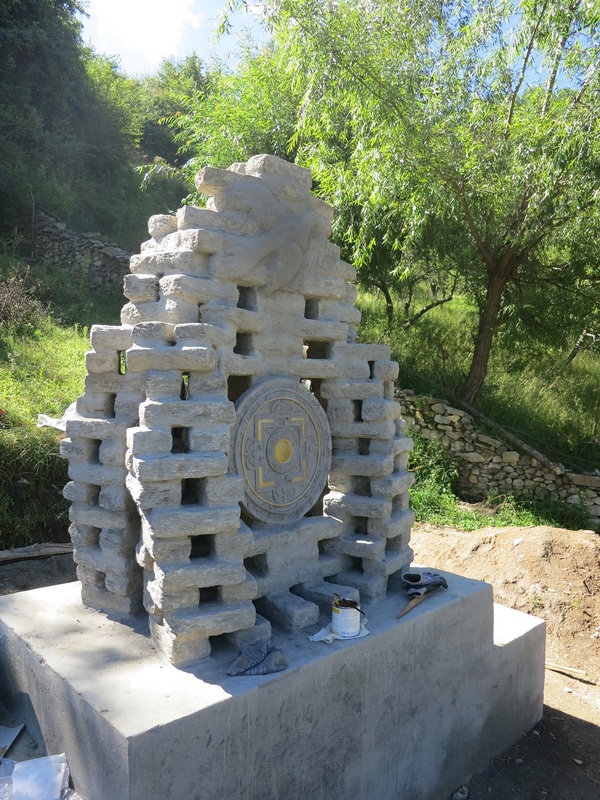 In the morning at nine o’clock the people of Jumla gathered at the Shaanti Vaatika to celebrate this special day and to unveil the peace sculpture. Several speeches were held inter alia from Rhada and Helga herself. 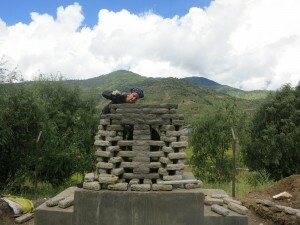 Helga told why she has come to Jumla and has built this peace sculpture. She explained how Rhada’s vision of establishing peace and making peace grow around the whole world inspired herself too and caused the wish to support Rhada in her efforts. Also about the sculpture she said a few words: She compared her artwork with a house as there is some empty space inside. This empty space is to be a space for thoughts, for all the peaceful thoughts of the Jumli and of anyone who comes and is ready to leave her or his thoughts there. During the celebration a traditional women’s choir performed songs and dances, a school choir performed one song, little presents were given to one another. The only thing that one wouldn’t have expected at this peaceful gathering was this high presence of the military force which immediately makes you remind that some years ago this region, this land suffered under a terrible war. Reminded of this fact, the whole importance of such a celebration becomes clear, the whole importance, the whole seriousness, the whole sadness and at the same time the whole power and dignity of these brave people who celebrate. It becomes clear that this is no joke. And it could make you cry. We’re happy to could have contributed to the celebration of Peace Day with our artwork. It’s not much but it’s something that we’ve left to the people of Jumla. In return they made our stay to a real memorable experience which we learned from a lot. Thank you, dear Jumli! Thank you all and we wish you good luck to continue your work of establishing a peaceful living-together! We wish you good luck to build the Shaanti Vaatika! Tomorrow we’ll fly back to Kathmandu and after one week return to Austria. 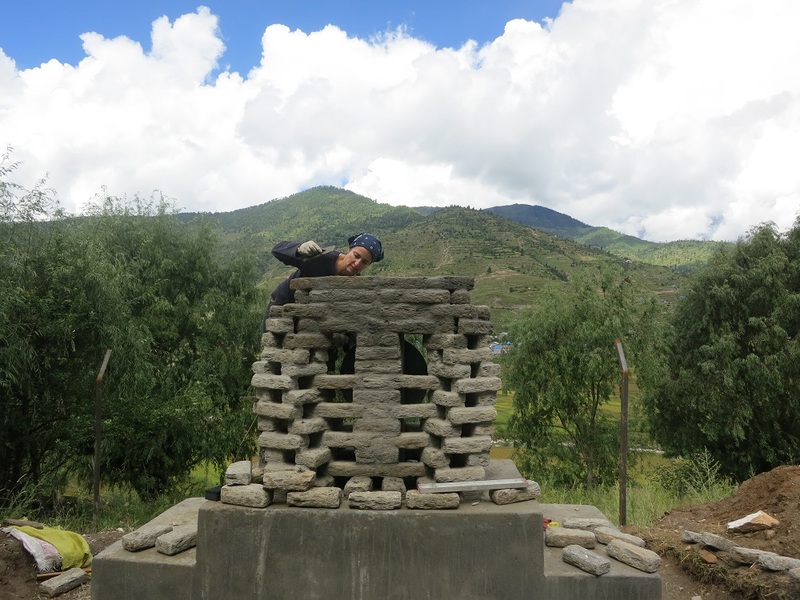 We’re glad to have successfully finished our project in Jumla and thank you all for your interest and participation! Good bye! 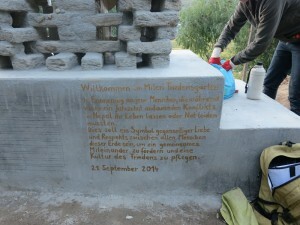 habe alle Bilder angesehen und den Blog gelesen. Alles sehr interessant und spannend. du hast deine neue Berufung-als Reporter-gefunden! Bin erst heute dazugekommen, deinen Blog zu lesen und bin beeindruckt! Liebe Helga, schaut echt cool aus Eure Skulptur! Überhaupt toll, dass Du damit so in die weite Welt gehts! Bist eine echte “Botschafterin” Kärntens und Österreichs! It is always a fascinating experince, when you travel that far. Totally different cultures, poverty, position of man/women; a splendid blend of impressions.